During the summer of 2012 in the Black Hills, I worked as the lead photographer for the Borglum Historical Center, a museum about the man who carved Mt. Rushmore. I took photographs of tour groups in front of Mt. Rushmore, edited and printed them, and delivered the prints to the tour group. I also helped maintained the museum front desk and gift shop. This presentation completed my required credit for my internship in Keystone, South Dakota. I presented where I worked, what my job entailed, what I learned from Dakota State University that helped me during my internship, what I learned for my future career and what I learned about myself. I wrote this short story in my Creative Writing class. The objective was to first form groups of four people and brainstorm seven words, whether they were adjectives, nouns, or verbs. We were to use these words in our short story as well incorporate a pregnant woman and a broken down car. The words we were supposed to use are in bold. 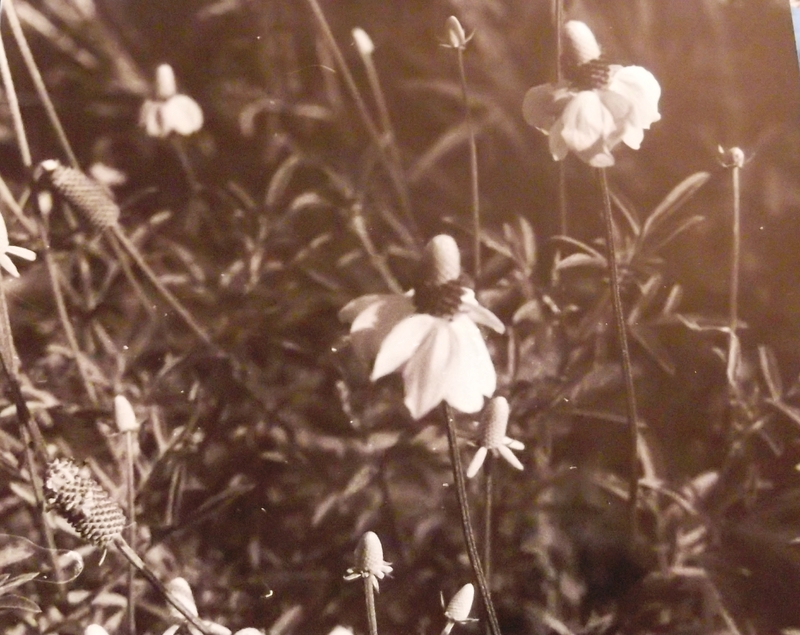 At first, I thought this composition would become some odd dream I would write about. After some frustration, inspiration finally came knocking. I decided to create a tragic love story, despite my thoughts about this type of plot. In the end, I was quite pleased with my work. Click the title of the post to view the publication. Click on each photo to view a larger image. 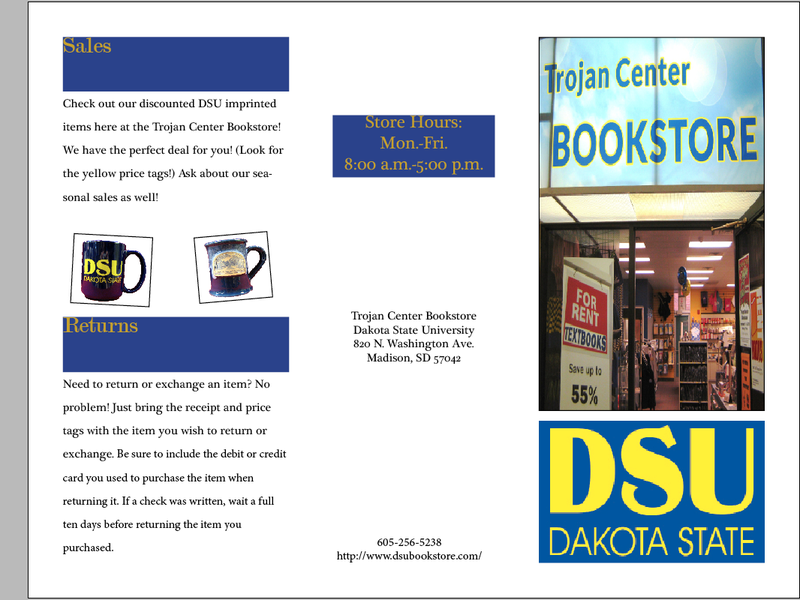 Brochure for Trojan Center Bookstore made in InDesign for my Desktop Publishing class. The objective was to choose a client and create three publications for them. This was one of the three. Side 1 of TC Bookstore Brochure. 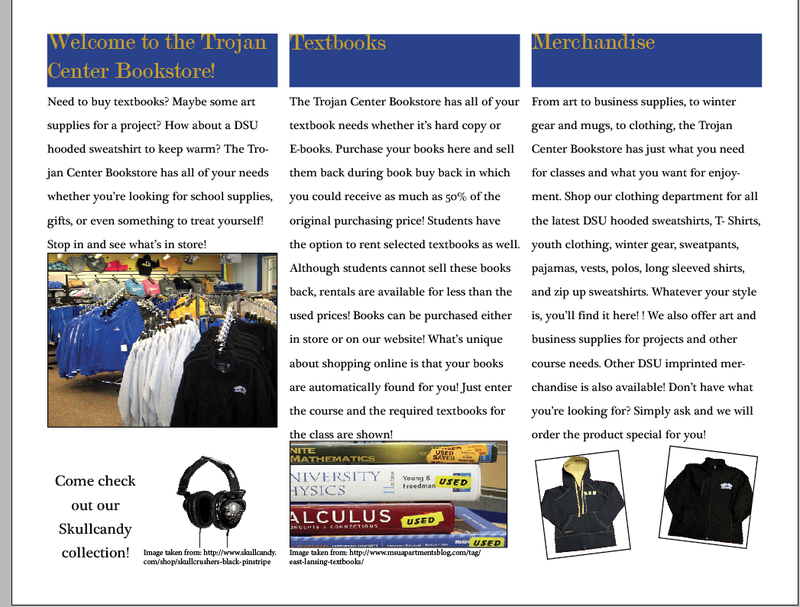 Side 2 of TC Bookstore Brochure. I completed this final paper for my Sociology and Technology class where we discussed the basics of sociology as well as how technology affects it. For this assignment, I was to choose one of the provided films and analyze it based on what we learned throughout the class. This analysis was considered our final test, so there were specific requirements for the sources we used such as two different discussion posts made in class, different topics from the text, and outside sources we used for assignments. I chose the film Avatar as it depicts many aspects of society and technology today. Software manual created in Documentation and Presentation class where we learned how to write specific documentation for the computer industry. This teaches us how to build technical writing skills as well as present ideas. For the final project, we were to design and create a digital manual for novice users for a specific software. We were to choose a client, approach the client with the idea and create the document. After creating it, we were to present the document to our client. I chose to create a manual for Photo Story 3 for Windows as many Intro to Design classes use this software. *This is a large file. Please allow some time for it to load. I wrote this analysis in my The Evolving Stage class where we read and discussed popular plays and their meanings. The objective of this assignment was to analyze a play we have read in class. I chose to analyze the play The Importance of Being Earnest by Oscar Wilde. I focused on the idea of marriage during the time period the play was written which was the nineteenth century. I discussed the different views of marriage portrayed in the play and compared them to today’s ideas of marriage. I quite enjoyed reading and analyzing this humorous drama.